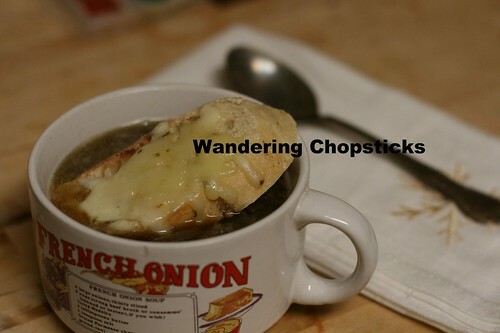 When I first learned how to make French Onion Soup about a decade ago, I used to make it at least a few times a year. The cookbook instructed me to cut the onions into whole rings, which can be a bit of a bother. Slicing the first half of the onion wasn't so bad, but the second half became unwieldy and difficult to cut thinly. What a silly reason to stop making such a delicious soup. 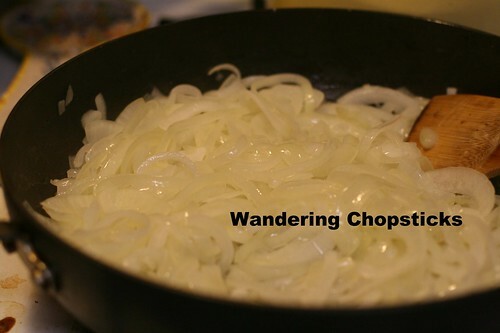 Or even sillier was feeling like I had to slice onions exactly the way a cookbook told me. So when I was craving the caramelized cheesy goodness, I decided to be daring and slice the onions in half before slicing them thinly. No more rings! 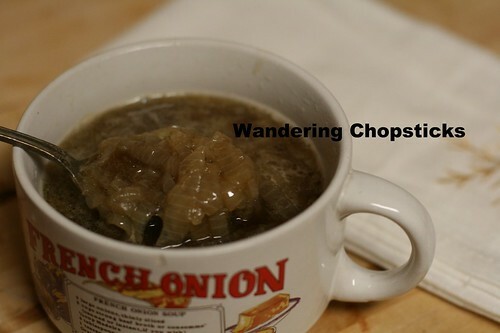 Sure the soup won't look as pretty, but the smaller onion slices also meant it was easier to spoon. 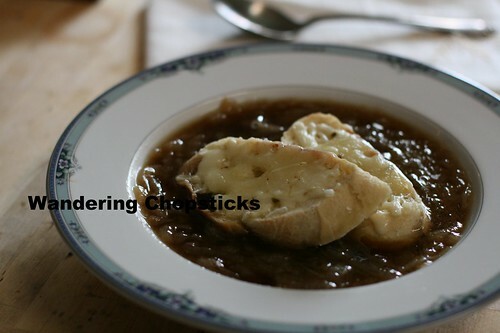 Really, the key to a good French Onion Soup is patience. Patiently slice the onions thinly. 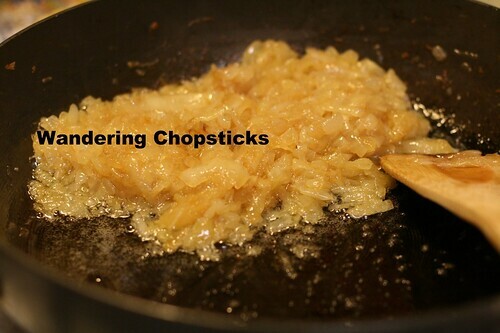 Patiently wait for them to caramelize. It takes about 45 minutes, but it's so worth it. 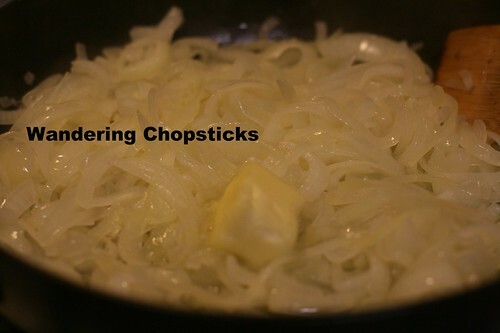 If you cheat and slice the onions thicker or add the broth before they've properly softened, it just won't taste the same. So just be patient, I promise it'll be worth it. 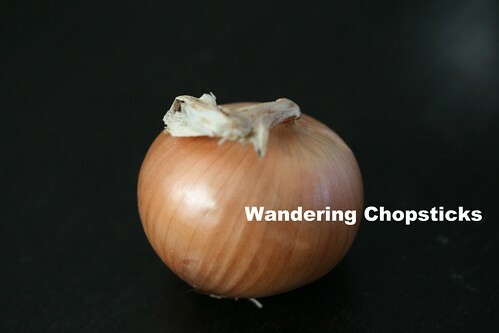 I've been waiting for years to use this onion picture from May 2009. It was the first picture I took with my new used dslr. 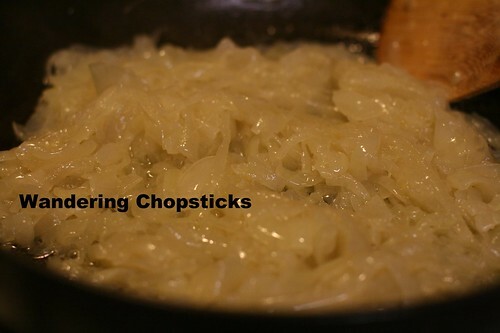 Slice the onions in half lengthwise, and then in thin slices. 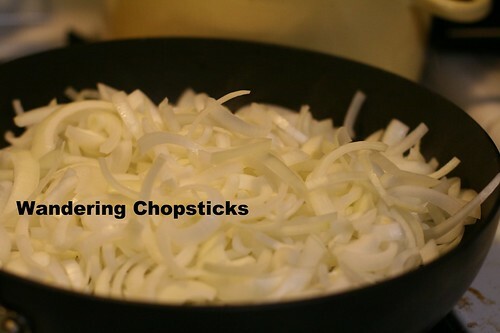 Or keep the onion whole and slice into rings if you wish. Drizzle a generous tblsp of olive oil in a large pan on medium heat and add the onions and 1/4 tsp salt. Stir for about 5 minutes until the onions are starting to soften. Then add 2 tblsp butter. 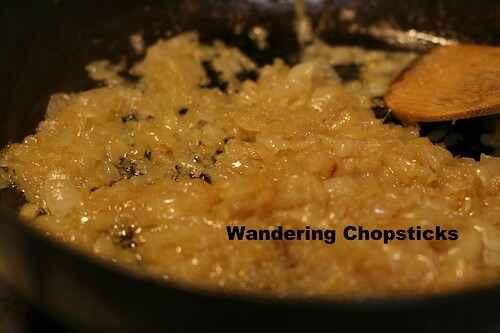 After half an hour, the onions are markedly reduced, but not caramelized. Keep going. 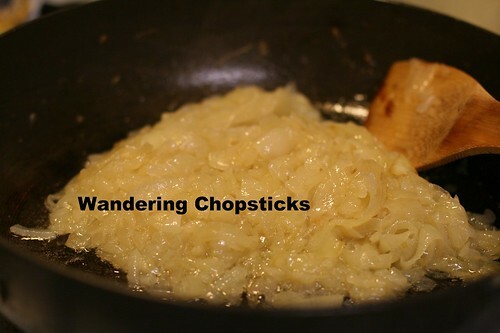 At 45 minutes, the onions start browning. 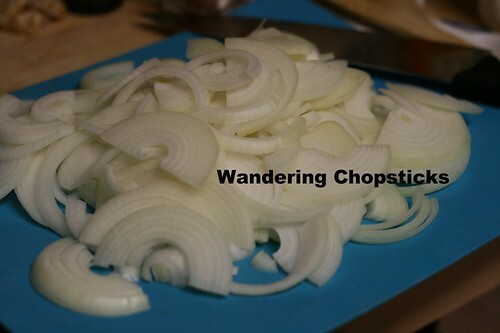 Stir continuously and watch closely because the onions are almost ready. 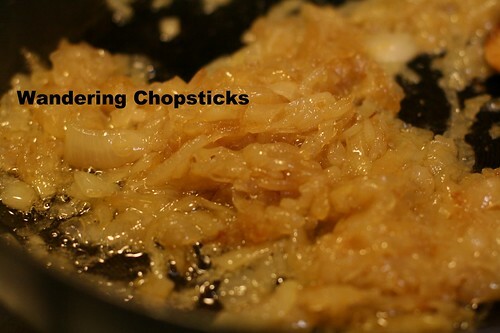 Another minute and the onions are perfectly caramelized and softened. Add 32 oz of beef broth. Or vegetarian broth if you wish. 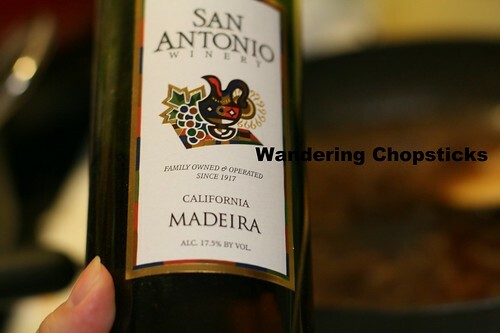 And about 1/4 cup of madeira or other wine of your choice. Add a sprig of thyme and let the soup continue simmering. 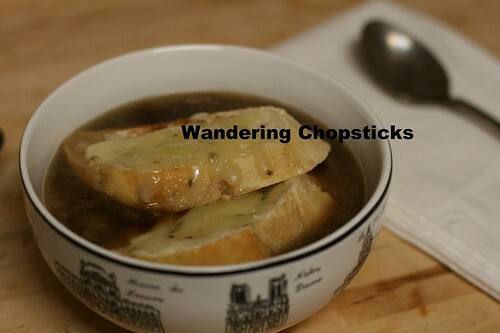 Meanwhile, add some shredded cheese on baguette slices and pop them in the toaster oven for a few minutes. Taste the soup and adjust seasonings if necessary. Wait! It needs a cheesy baguette slice before it's perfect. 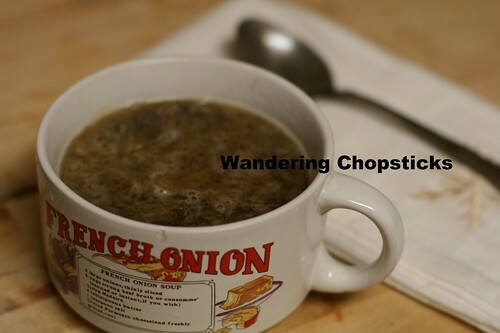 Like my French onion soup mug? I picked it up at the thrift store. I have a whole set of other soup recipe mugs. 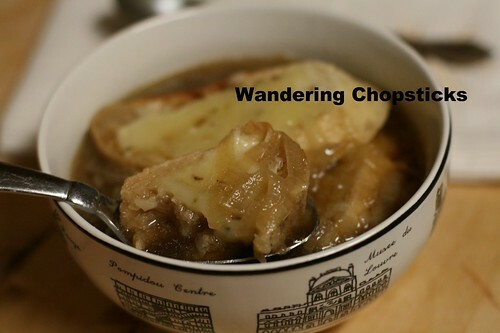 What if I served French onion soup in my French bowls? You can't tell the bowl is French? How 'bout now? What's more French than the Louvre and Notre Dame? 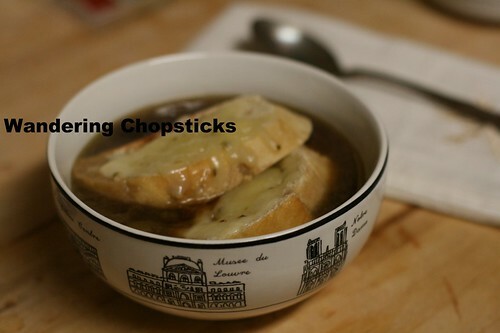 My favorite part is immersing the cheesy toast into the broth before spooning it up. 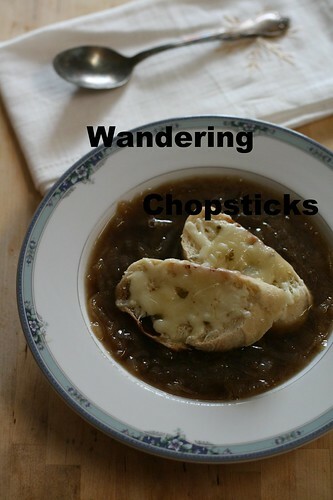 2 years ago today, Ask Wandering Chopsticks 5. 3 years ago today, Sea Harbour Seafood Restaurant (Dim Sum) - Rosemead. 4 years ago today, Thit Heo Kho Dau Hu (Vietnamese Braised Pork with Tofu). 5 years ago today, one of my favorite broken rice restaurants, Da Nang Com Tam Tran Quy Cap - Westminster (Little Saigon) and one of my most popular recipes, Cha Gio (Vietnamese Egg Rolls). And instead of beef broth I like to use beef consomme! Sooooo good. I am a "regular" at thrift stores around my city, but I haven't come across special things that you have acquired! I guess I have to look more closely. The soup sounds easy enough to make, and the soup mug adds the "flavor". Thanks for easy to follow instructions and the pictures too. You have wayyyy more patience than me! The 45 minutes I go for is pretty long! 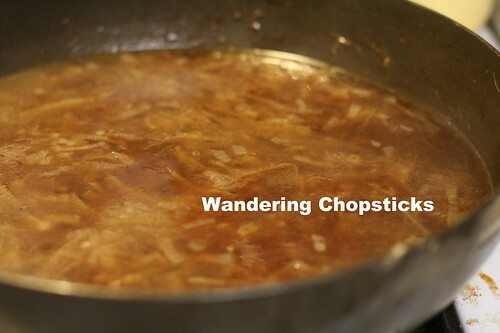 If you add soy sauce to the onion jam, it makes a great dipping sauce for chicken. Or add bacon to the onion jam. I have chicken, chili, tomato, and mushroom soup mugs. I'm on the lookout for oxtail and Scotch broth and I'll have the whole set as far as I know of. I actually saw oxtail and Scotch broth soup mugs before I started collecting them, but didn't buy any. Then after coming across these mugs so often, they kinda grew on me. I have a set of pie plates too with recipes on them for pecan, pumpkin, strawberry, apple pies, and cheesecake. Kitschy, but I love them.